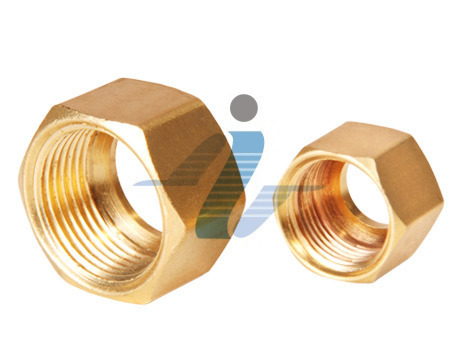 We have introduced ourselves as one of the foremost manufacturers of superior quality Brass Nut. These are developed from high graded raw materials using modern technology. Our range is perfect to fulfill the needs of our clients. The silent features and quality of our products has made us most demanded company. Available Size (Tube O.D.) : 1/8” to 1”4 MM x 16 MM. We, Imperial Brass Component, have more than a decade of experience as reputed manufacturers, exporter and suppliers of an assortment of Brass Products. We are highly capable and have gained ISO 9001-2008 certification from TUV. Our products are developed from superior quality raw materials and advanced technology. Our product range comprises of Brass Pipe Fittings, Brass Compression Fittings, Brass Flare Fittings, Brass Hose Fittings, Brass Valve Fittings, Brass Sanitary Parts, Brass Gland Fittings, and Brass Anchor Fittings. We fabricate products which are renowned for effective features like durability, strength, dimensional accuracy, corrosion resistance and abrasion resistance. Due to our excellent infrastructure and diligent workforce, we have gained a firm foothold in the industry. We source our fine quality raw materials from reliable and highly certified vendors of the market. Due to our supreme quality of products, we have rapidly expanded our client base across the Indian Subcontinent. We are looking for International Enquiries.